Comprised of multiple embossed layers of stainless steel with the outer layers utilizing a Viton rubber coating. Compressed operating thickness is 0.030". Cometic MLS (Multi-Layer Steel) Head Gaskets provide maximum sealing performance for todays high output engines and require no sealants. 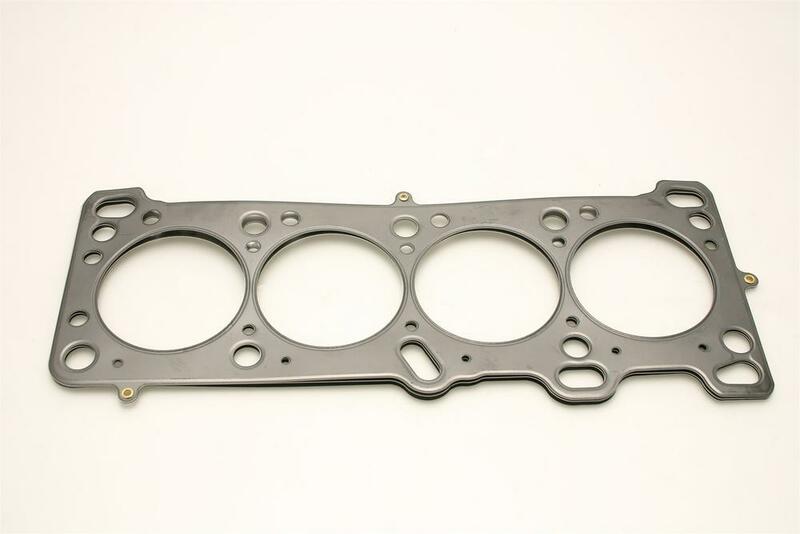 MLS gaskets are ideal for both aluminum heads to aluminum blocks and aluminum heads to cast iron blocks. They can withstand the shearing force created by the two materials. MLS gaskets have increased strength because they are comprised of multiple layers of stainless steel; which also creates the ability to rebound and resist corrosion. The outer layers are embossed and coated on both sides with Viton (a flour elastomer rubber based material that is heat resistant to 250 C/ 482 F). Viton is designed to meet the demands of a variety of harsh sealing environments, load conditions, and surface finishes. The center or shim layer is uncoated stainless steel, which can be varied to accommodate multiple thickness requirements. Cometic is dedicated to customer satisfaction and provides quality products, delivered on time at a competitive price, designed for each customer's specific application. Cometic is an industry leader in manufacturing processes and committed to pairing the highest possible quality materials with knowledgeable personnel. Cometic is also dedicated to continually improving all areas of its operations through employee development and involvement, as well as continual and comprehensive reviews of customer feedback. To ensure superior performance across a wide variety of engine types and sizes, Cometic manufactures gaskets from a comprehensive range of materials. Whether the situation calls for the latest in advanced technology like the MLS (Multi-Layer Steel) Gasket, or a synthetic blend such as Aramid Fiber, Cometic finds a solution. Cometic stays on the forefront of gasket design technology by utilizing in-house dynamometers and engine assembly rooms to bring its distributors, retailers and ultimately the end-user, the most reliable gaskets available today. Cometic combines advanced materials with the most current manufacturing processes to provide custom-tailored solutions to meet the needs of each individual customer. Engineers analyze the environment in which the gasket will perform, select the proper material, and apply the appropriate technology to offer the best-performing gaskets available in today's ever-changing marketplace. Cometic gaskets are the industry standard for championship-winning teams across multiple disciplines of both professional and amateur motorsports.